In an age where 3-D printers are becoming a more and more common tool to make custom designed objects, some researchers are using the technology to manufacture replacement parts for the most customized and unique object of all–the human body. 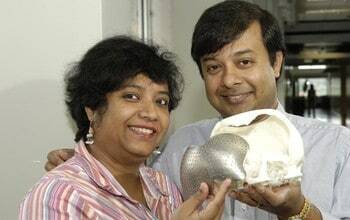 With funding from the National Science Foundation, a husband and wife duo–materials scientist Susmita Bose and materials engineer Amit Bandyopadhyay–are leading a team of researchers at Washington State University to create implants that more closely mimic the properties of human bone, and can be custom-designed for unusual injuries or anatomy. Using a technology called Laser Engineered Net Shaping (LENS®), these new implants integrate into the body more effectively, encouraging bone regrowth that ultimately results in a stronger, longer lasting implant. In the LENS® process, tiny particles are blown into the path of a laser and melted. The material cools and hardens as soon as it is out of the laser beam, and custom parts can be quickly built up layer by layer. The process is so precise that parts can be used straight off the printer without the polishing or finishing needed in traditional manufacturing. Implant manufacturers using this strategy could simply start with a CT scan or MRI and use that to make a 3-D model of the injury. A consultation with a physician would determine where the problem was and how to repair it. There is a real need for these sorts of solutions for people with complex injuries, such as victims of traffic accidents or natural disasters. Not every implant needs to be custom manufactured. In most cases, surgeons can choose a standard-size implant based on the anatomy of the patient. The standard materials for weight-bearing implants–titanium or stainless steel–are well-tolerated by the human body. Nevertheless, these metals have different properties from the bone they replace. Although bone seems stiff and solid, it in fact has some “spring” and millions of microscopic pores. Because a metal implant is much stiffer, the surrounding bone doesn’t have to support as much weight as it normally would. This is a significant problem with today’s implants. Bones weaken and break down when they aren’t properly exercised. LENS® can be used to make parts out of many different materials, including metals and ceramics. Unlike many traditional manufacturing processes, LENS® allows different kinds of materials to be easily combined into a single part. The heating and cooling processes are so fast that the component materials don’t react with one another to create unexpected materials or properties. “Once we built confidence that the properties of LENS®-manufactured implants were the same as standard implants, we then focused on materials that were difficult to manufacture, like tantalum. We can make a tantalum implant or coating in less than 15 minutes, even though its melting temperature is over 3000 degrees Celsius,” Bandyopadhyay says. Tantalum is non-irritating and can directly bond to hard tissue like bone. This gives researchers like Bandyopadhyay greater control over how implants interact with the body. A metal core can be coated with a thin ceramic layer, for example, so that new bone is more likely to grow and bond with the implant. And because LENS® builds a layer at a time, implants can be manufactured with structures that are difficult to make using traditional techniques. They can have pores in the center but be solid at the edges, or have texture on the surface to help bond with bone or other biological materials. Porous structures are particularly challenging to make using traditional manufacturing, yet they are potentially critical in making implants that more closely mimic natural bone. The LENS® process allows implants to be manufactured with microscopic holes for bone to grow into and attach. The holes have the added benefit of making the metal part less stiff and more like the bone it replaces, also helping the bone grow. When bone grows into an implant, it forms a strong bond between the two and makes the bone less likely to degrade. The less the bone degrades, the less chance a replacement might be needed. Early in development the greatest challenge was to show that the material produced using the LENS® process showed similar mechanical and physical properties compared to standard implants. Over time, the technology has matured to a level where it is reliable enough to become commercially feasible. Bandyopadhyay expects that by 2020 custom-designed and manufactured implants will become commonplace.